One of the 188 Liberty ships, build by Delta Shipyards in New Orleans during World War II. Type: US cargo ship for mass-production, built 1941-1945. The design perfected by Henry J. Kaiser shipyards in the United States, the Liberty ship type helped to win the ‘Battle of the Atlantic’ for the Allies. This 10,000-ton freighter were constructed of prefabricated sections that were welded together and could be assembled in less than 5 days. 2,710 units were built by 18 American shipyards. The design is simple yet and goes back to the British Ocean-type dated from 1879. The rapid mass production of Liberty ships formed the compensation for the losses of Allied merchant ship in the ‘Battle of the Atlantic’. Original ordered by Britain from US shipyards, the costs for the first 60 Liberty ships amounted to a total of 96 million US Dollars. Later, the construction costs fell even further. The ships had large cargo space for about 440 light tanks or 2,840 Jeeps. The first Liberty ship was Patrick Henry, who was launched in Baltimore on September 27, 1941. The construction of this first ship required 244 days and she comissioned on December 31, 1941. Later, with individual, prefabricated sections, the construction required an average of 42 days. The fastest build ship was the Robert E. Peary, which required from keel-laying to launching only 4 days and 15 1 / 2 hours. Three days later the ship was ready for a test drive. However, the quality of production of these simple vessels was very poorly suited and only useful for critical times of war. Although many were still used many years after WW2, more than 100 ships sank in the first ten years by hull and deck cracks due to brittle fracture. The reason for this was, that before the 1950s, the welding techniques that were used the first time for the mass-production of these ships, were not yet mature. Usually ships at this time were still riveted. Hellas Liberty (ex-U.S. Arthur M. Huddle) as a museum ship in Piraeus. 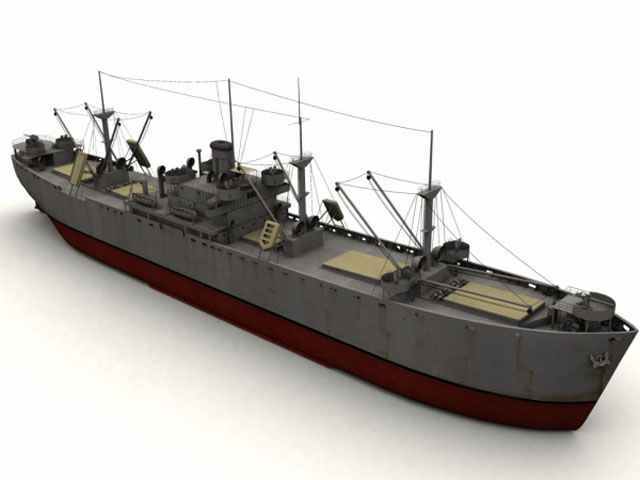 3d model of Liberty ship. Completed 2.710 ships: first launch on September 27, 1941, first service entry on December 31, 1941. First US ship launched September 23, 1942; 10 days after keel had been laid. In 1943, three ships were completed daily. Last ship (SS Albert M. Boe) delivered on October 30, 1945. Average construction time 42 days.